Helicopters are notoriously tricky to fly, but Lockheed Martin and DARPA modified a commercial helicopter so that a person off the street can fly it with just 45 minutes of training. In a probable nod to that scene in The Matrix when Tank downloads instructions for flying a helicopter directly into Trinity’s brain, Lockheed and DARPA call the new system MATRIX. 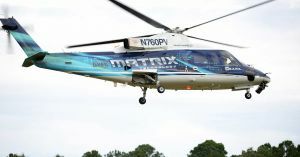 It doesn’t interface with the human mind, but it reportedly makes flying a Sikorsky S-76 helicopter so straightforward that pretty much anyone can do it. You can use a tablet screen to give instructions to DARPA’s idiot-proof helicopter, which uses LIDAR and cameras to take off, land, avoid obstacles, and follow directions. During test flights in Virginia, trained pilots stayed in the DARPA helicopter in case there was a safety issue — but they never had to take over, according to Breaking Defense. We’ve reported previously on DARPA’s efforts to build a helicopter that a pilot could fly with a tablet, but the system in this DARPA helicopter is so straightforward that people with no previous training as pilots can fly it. Lockheed and DARPA are now working to install the same tech in a Black Hawk helicopter, a military standby also manufactured by the Lockheed-owned Sikorsky. Helicopter pilots take note: Robots are coming for your jobs, too.